The Cuaba Distinguidos is an elegant and exceptional medium to full Habano, of 52 ring gauge, 6.4” (162mm) long and comes in a box of 10 cigars. As each Cuaba cigar, this vitola stands out from the crowd being an elegant double figurado, reminiscent of the cigars famous in the 1900s. It is not a flat cigar, but instead it is bulging around the foot and its both ends are tapered in a pigtail manner; however the tails have been cut off. The quality of the cigar stands out in the way it is rolled and by its amazing blend. The flavors provided by cigar are of the same high quality. It is really a must try stogie. The Cuaba Distinguidos is a very good option to stand out from the crowd thanks to its classic double figurado shape. •	To top it all, the construction is perfect and allows for an almost 2 hours smoke. •	Creamy and sweet smoke, with rich flavors of wood among others. 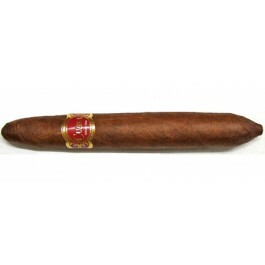 This cigar is not as strong as it seems and is a great morning or afternoon smoke. The Distinguidos’ look is simply stunning, it is definitely different from modern cigars. The seams are invisible at the foot or at the end and there is a bit of oil on the wrapper. The cap is beautifully applied at the head with a single leaf of tobacco. The wrapper is of medium brown, pretty uniform all along, and there are few visible veins on it. The construction of the cigar is amazing, it feels light in hand but it is well packed from head to toe, with no apparent soft spots and the right amount of give when squeezed. At cold, the wrapper smells of sweet hay with some woodsy notes. And the pre-light draw offers ample sweet tobacco notes, with hints of nuts and of cedar. Once cut, the draw is just perfect, just as the construction of the Distinguidos is amazing. It lights up very easily thanks to its small foot, and right away releases plenty of a thick smoke. The first flavors to reach the palate are of sweet tobacco, and some faint wood and earth. It is pretty oily and creamy, very beautiful balance between strength and aromas. The burn line is sharp but slightly wavy, however it tends to fix itself further on, and no touch-ups are required. The cigar is smoking slow and the ash builds up very well at the foot, it has a nice dark grey color, and it is not flaky. It holds on for more than an inch before falling off. It is a pleasure to smoke such beautifully shaped cigar, especially when the construction is flawless. The first third of the cigar is dominated by woodsy flavors of cedar, some faint tobacco and nice roasted flavors. The strength is somewhat between mild to medium and a medium. Few draws in and the typical rich nutty flavor comes in (peanuts), and there is also some nice and sweet buttery, doughy bread kind of flavor. As the cigar progresses, the strength ramps up and the Distinguidos is now a solid medium body. Herbal notes are also emerging in the background, as well as some sweet honey hints and a faint and sweet spice element. In the middle third, the tobacco and nutty flavors are still in the foreground, while the other dominant flavors are of cedar, sweet cookie dough but the spice is more noticeable now as well as some other darker flavors. Some cocoa, some licorice and some faint coffee aromas join the mix. Overall the cigar is still very creamy and sweet. There are still notes of earthy aromas, some floral flavors and a more noticeable white pepper spicy note. The body is now more leaning towards a medium to medium strong. In the final third, the flavors are still pretty powerful; the body of the Distinguidos is still between the medium and the medium to strong range. However, the sweetness and the creaminess of the cigar now take over the strength of the cigar. The sweet cookie dough flavor is still dominant. The coffee notes and the licorice are also coming in the foreground while the spices pick up in intensity, but do not make it spicy whatsoever. There are also notes of hay, citrus and peanuts. No harshness in this last third, and it is still smoking pretty cool, so it is a pleasure to smoke it until the nub. In summary, this is a pretty rich cigar but that remain creamy enough to let you enjoy all its flavors. It has to be smoked slowly in order to get the best of it.